Last week, we wrote that Riot Games was throwing out the lore League of Legends has built up over the past five years and replacing it with something new. Now we know what that something is, or at least what's coming first in LoL's rebooted fiction: a gameplay event tied to the desert empire of Shurima, which includes the launch of a new champion named Azir and a new game mode called Ascension. Ascension takes League's combat off of Summoner's Rift onto a new desert map, where two five-player teams score points by capturing relics of Shurima. The big twist is a buff in the middle of the map: whoever lands the killing blow becomes Ascended, becoming powerful enough to take on the entire opposing team single-handedly. 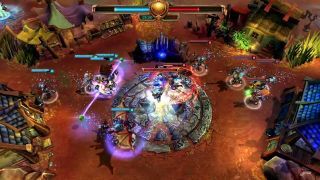 To kick off the event, Riot has released a short gameplay video of Ascension in action. In Ascension, player kills are worth one points, but capturing one of map's three relics of Shurima is worth three points. Destroying an ascended player, or the neutral Ascendant Xerath, is worth five points. The ascended champion earns two points per kill. Playing Ascension during the LoL Shurima event, which lasts until September 21, nets you Shurima icons to proudly proclaim your participation. If you're not into icons, well, at least you've got a new game mode to try out.